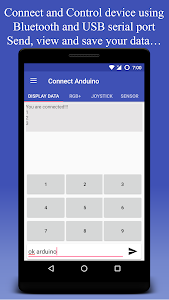 Use Connect Anduino to make two way communication with any micro-controller using Bluetooth or serial port/USB communication with different options available. Use the below mentioned features using both type of communication. ⚫ Serial Port/USB Communication: Your phone should be compatible of OTG support and deliver enough power. Set the Serial port in the settings, select you baud rate, parity, data bit and stop bit. 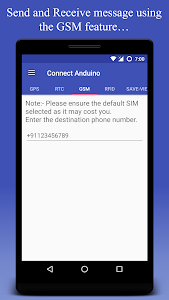 ⚫ Bluetooth Communication: Connect to the last Bluetooth device automatically or set the Bluetooth device from the app option menu with auto retry feature. 1. Set the button name and value and view the sent and received data on the 'DISPLAY DATA' tab (You can also type command that you want to send). • There are different escape sequence available that can be select or simply write an escape sequence at starting or end of data every data sent by 'DISPLAY DATA' tab. 2. Control your RGB led or led intensity. Range in-between 0 to 1024. 5. Graph tab to plot the graph with maximum 2000 data points. Bar graph and line graph available. Future updates will improve and include many other features for plotting graph including saving the graph values and its snapshot. 6. 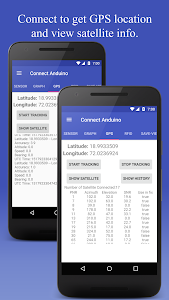 GPS tab to get latitude, longitude, altitude, speed, accuracy, bearing, UTC time. You can also view the number of satellite connected. 7. 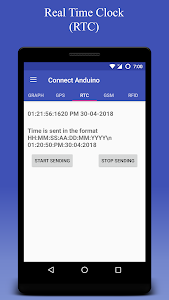 RTC tab to get date and time from android phone with custom refresh interval. Note: Current sending format HH:MM:SS:AA:DD:MM:YY. 8. GSM tab for sending and receiving message directly from your android phone, no additional module required. Use phone as a GSM module. 9. NOTIFICATION tab for generating custom notifications sent from the connected device (ending character '\n'). 10. RFID tab for reading tags and cards and send its data. Note: Your device should have the supported NFC hardware. It can also read metro cards and other supports tag like Mifare, NDEF, RFID, FeliCa, ISO 14443, etc. 10. PROXIMITY tab for using your phone proximity sensor. 11. SPEECH tab for directly talking to your microcontroller just tap on the mic. 12. Save some specific values for reference in the SAVE-VIEW DATA tab by just clicking save. 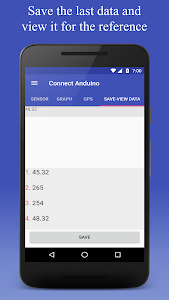 WiFi and IoT feature (Enroll for Alpha 2 testing available at selected countries only). Sign up and enroll for upcomming IoT feature. 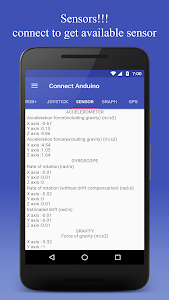 App arduino library available on github (for link see the help section). Customise the number of tabs on home screen. For more information and code see HELP section. This is not enough in the future updates you will be able to customise app, save your data, connect using WiFi, etc. 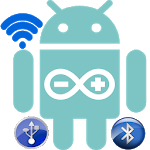 So, that you can connect and control every thing right from your android smart phone. Suggest us about the feature that you would love to have in our future updates by providing us with the Feedback. App is under developing stage and getting better day by day.